This blog is free. There is no premium content for subscribers only. It has no ads. I don't sell software, trading courses, newsletters, or do coaching. Hopefully that means the material in it should be free of bias of all kinds (Except for my own stubborn opinions). To be crystal clear: I make no money whatsoever from it! So if you appreciate this blog and want to say 'thanks'; then you might consider buying one or both of these books (which will have the added advantage of hopefully significantly improving your trading or investing). 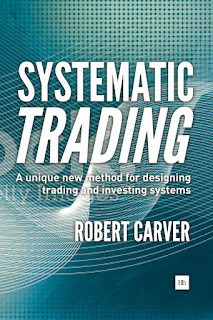 Hi Rob, in your book "systematic trading" you show that it takes an unexpectedly long period of backtesting data to support a significant positive Sharpe ratio. I would have thought that the significance of backtesting Sharpe ratio would be related to the number of trades rather than the duration of the backtest. Hence, a backtest of strategy with thousands of trades in say two years may be more signifncant that 20 years of backtesting of a strategy with only 100 trades.... Could you please elaborate? Thank you. You could look at the distribution of trades rather than of time history, but it won't usually give you more statistical significance unless by trading more often you also get higher annualised performance. I haven't got time or space to explain the maths here, but this would be a good choice for a future blog post. I'd love to see a blog post on this! by annualised performance do you mean sharpe ratio for that year or straight returns? supposing it is only returns for that year, I guess you'd also gain statistical significance if trading more often also gave you lower variance? Annualised performance is just performance for the year. Hi Rob, while we're on the topic of Sharpe, could you elaborate on how you generate the standard of deviation of Sharpe (in the part where you talk about significant length of data)? You mention "random variables," does this mean your randomly change the optimizeable parameters for that year, and use the standard deviation? What do you run your t-test again? The rolling period? For the rest of your query I'm confused as to what article you're talking about so maybe post on that article as the answer could be different depending on the context. hi Rob. one question to your "Smart Portfolios" book. in the "Bonds" section you recommend exposure of around 25% risk weighting to Emerging Market bonds? I've tracked two good ETFs for that in which I can invest in Germany. One is investing in US-Dollar-bonds issued by Emerging market countries. The other one is investing in Bonds issued in their local currency of the EM countries. Would you have a preference for any of them (2nd one has 0.25% more cost per annum) ?